When piecing together the geologic history of the Earth, geologists rely on several key relative age-dating principles that allow us to determine the relative ages of rocks and the timing of significant geologic events. In a typical Historical Geology class or textbook, instructors/authors briefly discuss the important early researchers in the geological sciences, and then give the name of the stratigraphic principle, useful for relative age-dating of rocks and events, that these 17th and 18th century scientists are credited with discovering. After the instructor/author defines these principles, students are usually shown several examples so they can see how the principle can be applied. But why not start with the examples and let students discover these principles for themselves? Students are split into small groups which each work to discover a different relative age-dating principle. The groups are shown photos and given handouts with drawings of rock outcrops illustrating the various principles. 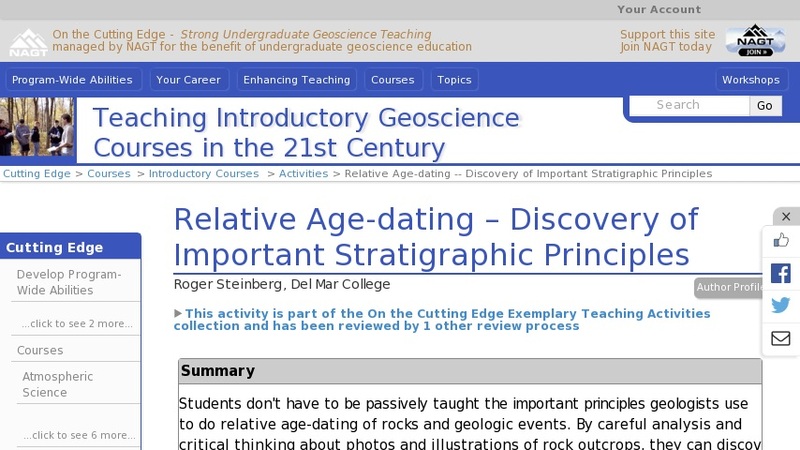 These handouts include worksheets for which they must answer a series of prompts that help lead them to the discovery of their relative age-dating principle. Groups must also invent a name for their principle, and select a spokesperson who will present the group's results to the rest of the class.